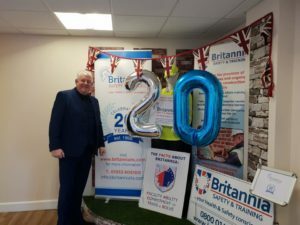 Launched 20 years ago by Colin Wright, Britannia Safety and Training is based in Wymondham Business Park. Originally a construction worker, Colin recognised a gap in the market in Norfolk to deliver health and safety training courses away from the distraction and disruption of training employees on site. The business has invested heavily in premises and staff over the years, moving premises twice to the current facilities with a purpose-built practical training area with classroom style theory facilities too. Over the 20 years in business the company has expanded to be recognised across other business sectors including aviation, manufacturing, food production and more recently the charity sector. Staff now work locally, nationally and globally. The business has grown considerably as a service provider and currently turns over just under £1 million a year and employs 20 staff, including 10 trainers. Britannia has moved the business into larger premises in recent years to accommodate growth. With fierce competition from self-employed trainers, virtual online courses and the CITB at Bircham Newton, the business has survived several recessions, the highs and lows of the construction world and technology advances; and has continued to grow the business year on year. There is a company strategy in place to develop the next generation of managers and staff for the business whilst introducing new technology and new services to support existing customers as big as Morgan Sindall, Carters, Balfour Beatty, Orbit and Saffron Housing; whilst continuing to attract new business in. SME customers are just as important to the company and Britannia also offers open courses to accommodate individuals requiring training at any time during the calendar year. “20 years on from that first pipe dream, well over 70,000 delegates have trained with us; we have 10 fantastic members of staff, 10 self-employed consultants and have provided substantial input on health and safety on projects around the eastern region and London. We have also been lucky enough to work in Scandinavia, Italy, Spain, Portugal, Gibraltar and more recently North Africa and the Middle East. I never envisaged 20 years ago that Britannia would be a global player” Colin Wright MD. Britannia recently launched a new service SafeBrit offering a consultancy, auditing and record keeping service, relieving customers of the minefield of keeping up with new and existing legislation and to implement and monitor a safe working environment on both temporary and permanent sites. This fills a gap in the market to support medium sized businesses without necessarily needing a full-time health and safety representative in the business. After many years of success in business the company has never moved far from the original goal to ensure the business maintains those early days ambitions to limit accidents in the workplace through promoting and training on health and safety issues by using common sense. “Over the past 20 years of Britannia, our business has grown to over 4,000 clients partaking in over 60 different training courses, whom also purchase working at height fall protection products, harnesses, tripods, winches etc. And now Britannia has just launched SafeBrit, the new forward-thinking, easy-to-follow Health and Safety consultancy. “As our business has grown, our reputation has remained intact and our brand has been accepted nationally with local authorities, blue chip and Build UK companies. We will continue to build on our past and continue to preserve and improve our service in the years to come, providing easy solutions to complex problems, meeting your training needs to match regulatory compliance” Colin Wright. With increased competition from self-employed trainers Britannia has managed to stay competitive through offering a comprehensive choice of services delivered both onsite and offsite, attracting repeat business from customers who recognise Britannia’s professional approach to delivering the right services for the customer at the right time.